SMPS or PSU is the component that supplies power to your major computer components. In this blog I have many useful articles regarding SMPS and continuing with that here I will tell you about the different types connectors or cables of a SMPS that supply power to various computer components and devices. 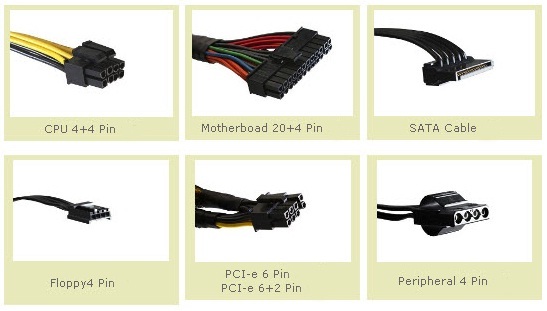 Here is the complete list and description of connectors or cables of a PSU that supply power to all your major hardware components of your PC. 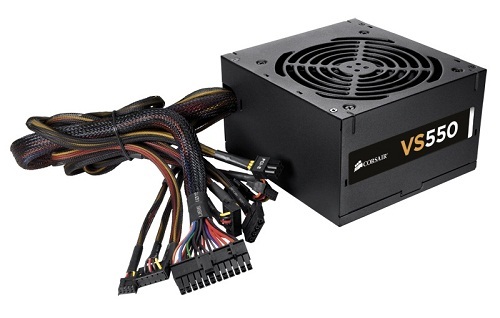 This is the main ATX connector that supplies power to your motherboard and other components like RAM, Low end graphics card, PCI cards that are connected to your motherboard. Earlier motherboards have 20 pin sockets only but now modern day motherboards require 24-pin power connectors. Therefore nowadays all the SMPS comes with 24 pin detachable connector (20 + 4) that can be split into 20 pin and 4 pin cables. This is the 12 Volt connector that supply power to your CPU or Processor. Some motherboards have 4 pin 12V CPU socket and some have 8 pin 12V socket, therefore most of the good power supplies come with 8 pin (4 + 4) detachable connectors which can be split into two 4 pin connectors. This power connector is used to power up SATA devices that mostly includes Hard Disks, DVD Writers / Drives. This 4 pin power connector is used to power floppy drives. Floppy Drives are not being used commonly, but in some cases they can prove very useful. Peripheral 4 Pin Molex Connector is used to provide power to IDE devices and other peripherals like Fans, case lights etc. You can also use this Molex 4 pin connector to power other devices like SATA devices, Graphics cards etc. by the use of converters or adapters e.g. Molex to SATA power connector etc. PCI-e 6 Pin or PCI-e 6+2 Pin are 12 Volt Connectors that are used to provide power to mid to high range graphics cards that requires extra amount of power for their working. Budget and low-end graphics card do not need them as they draw their power from the motherboard PCI-Express x16 slot only. Older mid to high end graphics card comes with PCI-e 6 Pin slot while the newer high end graphics comes with PCI-e 8 Pin slot. The new PCI Express 8 Pin cable can provide maximum of 150 Watts power which is the double that of the PCI Express 6 Pin cable i.e. 75 Watts. Note: The number and availability of these connectors varies and depends upon model and brand of the SMPS. Budget SMPS have less number of these connectors but high end Power supplies have higher number. hi akshat i have intel i3 3220 processor intel dh77eb mother board lg dvd drive and 1 tb hd.i want to buy corsair vs450 psu.in wattage calculator website it shows 245w.is there any problem to buy 450w psu. Corsair VS450 is a very good branded SMPS and it will be enough for your system. I think it may support it but if it does not then use your computer without UPS or get another UPS. Sir my. Pc spec is cpu i74790k.smps antec 650 watt.and ram is 16gb.mobo is Asus z97a.sir please suggest me the GPU for 4k.shall I buy zotac mini 1070 or 1060.gpu.space problem in cabinet so suggest me the small.thanks waiting for your reply. Which cabinet do you have? For 4K you should go with Zotac GeForce GTX 1070 Mini. I have I ball bassil cabinet sir. Sir please also reply that can my amps is capable to handle this GPU? sir my pc spec is smpsAntec 650.processor i7 4790k gpu.zotac 1089 mini.mobo Asus z97A.sir im confused about monitor i need 4k ips monitor for games and to watch tv serials i have tatasky hd setup box.please suggest me either i go for lg or asus i spend upto Rs40000 to 45000. please please please help me. Both are i good but o prefer LG more. Hi Akshat , is there any way to check if smps is working fine ? Any way to check all the connectors are workng fine ? Thanks for all your info and replies..
You can check it with a multimeter. Am a little confused-please help. Your higher end SMPS appear to have fans on the top with the plug point n the rear. If the fan is on top, how will the “hot air” go out. If inside the cabinet, will there not be heat buildup inside. the fan goes on the bottom and not the top.